So you want really bright, gaudy leaves? 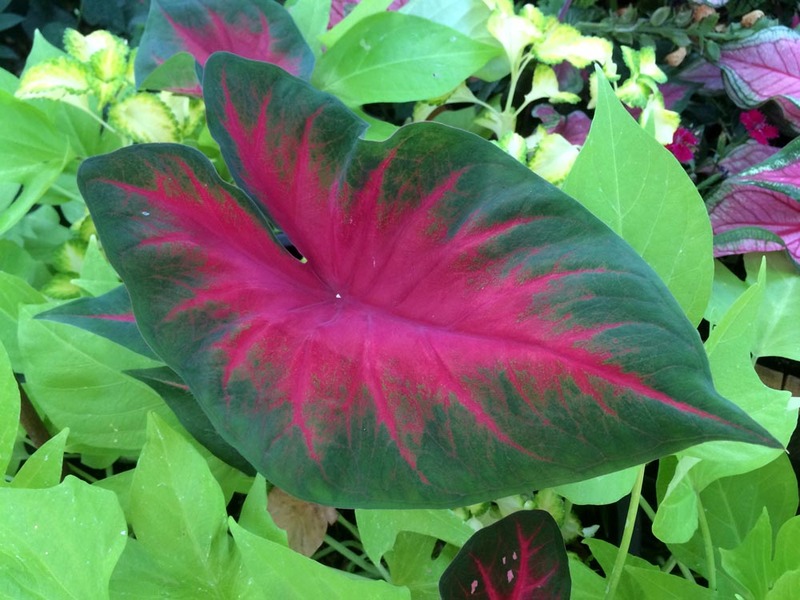 Caladiums are among several related plants called elephant ears due to the large, heart-shaped leaves. Nurseries always used to sell caladiums as tubers in springtime to be planted in shade for summer color. Over time, sales of anything in bulb form have declined to the point that many have stopped carrying them that way. Now you can find them growing in 4-inch pots in early summer. Like coleus, these give a lot of colorful bang for the buck. The flowers, which are inconsequential, just look like miniature calla lilies (caladiums and callas are in the same plant family). And like coleus, they can be grown as houseplants in a bright window. But their real impact is outdoors, and the colorful leaves show off even in fairly heavy shade. The flower garden around the Oakwood Village Welcome sign was my grandsons’ (Thomas) Eagle Scout Project. I buy caladiums from you every year. This year I bought the most and gave them to a few friends. I hope to spread the Happiness. Thomas T.
I just wanted to share a photo of the beautiful Carolyn Wharton caladiums that I ordered this year. I am a first time customer and plan to be a returning customer in the future. Beautiful plants from healthy bulbs, thank you. The photo was taken on my front porch in Buford, Georgia. Thanks! (to Happiness Farms) They are just beautiful. A perfect match with begonias . .
Close-up of “Florida Moonlight” with poodle statue used to surround a magnolia tree. 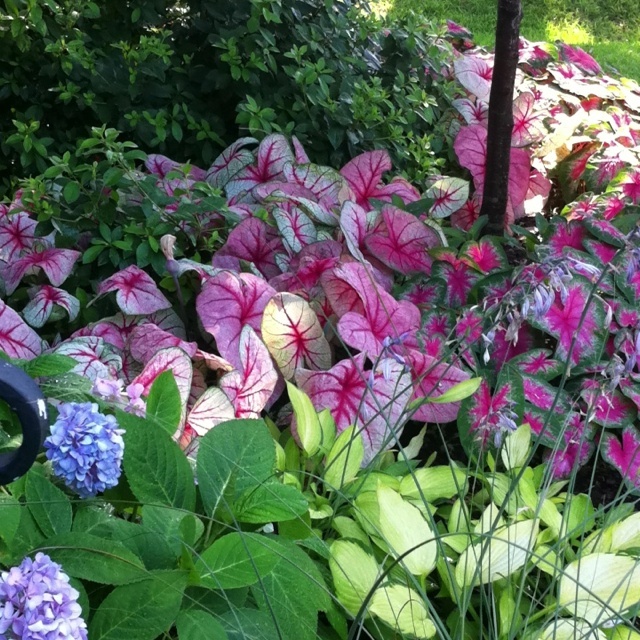 Summer Pink Caladium from Marcia McBrien in metal container. Another happy customer (Cydney Robbins) sent us this picture of her White Mix caladiums. These are all Caladiums from your farm, I get many wows from the neighbors! THOUGHT YOU MIGHT LIKE TO SEE WHAT I’VE DONE WITH YOUR CALADIUMS! THIS IS AN OLD GALVANIZED METAL DRESSER. I’VE OPENED UP THE DRAWERS AND FILLED THEM WITH CALADIUM BULBS AND JUST LET THEM DO THEIR THING. YOU CAN’T IMAGINE THE AMOUNT OF COMMENTS I GET ON THIS IDEA! JUST WANTED TO SHARE! Make plans now to join us at the Caladium Festival July 27, 28 and 29th.